Looking for the best books for 3 year old boys? We have the book list you need! 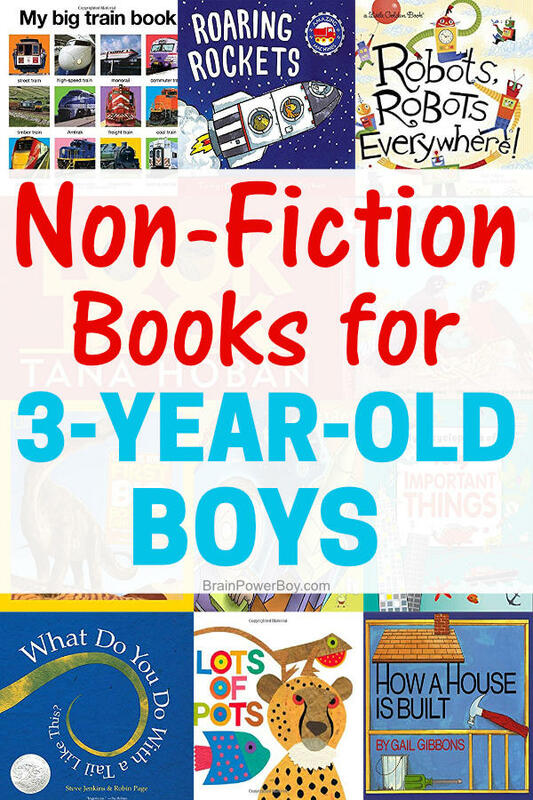 These are hand-selected fiction and non-fiction books that are simply perfect for boys age three. Gosh, but I love this age! Little boys are so curious about their surroundings and everything going on around them. They just drink in the world. Everything is interesting to them. Books are no exception! While there are 3-year-olds who are beginning to read, this is not very common. Boys are recognizing words on the page and that they mean something though. They are very aware of print in general and notice it while they are out and about on signs and on packages. They may know some of their their letters and recognize their name when it is printed. They know their favorite books and often repeat parts of a story in their own words. They “pretend” they are reading by saying what they remember from the book. Three year olds are beginning to gain vocabulary and know from 200 – maybe up to 500 words. There is no hard and fast number of words a child will know, we are just talking approximates here. They are learning as you are reading. Read to them a lot! Even if you have a wiggly boy who cannot sit still while you are reading, let him roam and you just keep reading. He is listening. Since you are looking for books for your young one, I made sure you will find some great books in this book list. I promise you that! I take a long time making selections for my lists so rest assured, they are good. When you are done here, be sure to see our best books for boys lists for more book ideas for your book lover. It is a bit difficult to make a selection base solely on age in my opinion. I do know, however, that by age book lists are helpful though so here you go! When choosing books for boys, you are going to want to keep his interests in mind. Each boy is unique. You know him best, so you can find the perfect books for him. I’ll aim to help! If he doesn’t care for a book, simply move on. There are so many good books out there. Your main effort should be to make sure that he enjoys being read to. If you focus on the love and joy that reading brings, you will pass that on to him and you may just end up raising a reader. Below are my choices for the best books for three year old boys. I have split this list into two parts. Fiction and non-fiction. I am likely to add books to this list over time. I am constantly checking out what is new and interesting as well as looking back through the books I read with my son when he was young to find a nice selection for you. I always include non-fiction books, even at this young age, because boys really like them. Especially if we are talking dinosaurs, cars, trucks and other fun topics they like. On to the list. If you have any questions or need help selecting books, feel free to leave a comment. I read and respond to all comments on my site. The books are in random order. Scroll through and find the ones that your boy will love. I also suggest that you grab a few that are different than what he is used to reading as you may just find another type of books he likes. Let’s start out with a classic from Dr. Seuss. Three is quite the perfect age for this book as they are beginning to understand all the concepts presented while at the same time they can get the humor as well. One Fish, Two Fish, Red Fish, Blue Fish is a favorite of mine. Oh, the many, many times I have read this book! Buy this and keep it on his bookshelf. I’ve saved our copy and will never let it go. Such a fun, silly book and a great way to learn about numbers, colors, and of course, rhyming. Oh, the memories! I have read every Curious George book there is. I wanted to share the treasury that I bought for my son but it is out of print and Amazon was selling it for over $50.00 through a third party sellers, so . . . I took a look at this one and I like it enough to say it is a very good substitute and quite similar to the one we have. The Complete Adventures of Curious George is the 75th anniversary edition. Wow, for 75 years kids (and adults!) have been enjoying the antics of George, the unforgettable curious monkey who always ends up finding some trouble to get into. Seven books are included in this treasury. You and your young one will read it again and again. This one is all about the illustrations. So. Much. To. See! In Cars and Trucks and Things That Go there is a story of the pig family going on a picnic. As they go along the narrator tells what is happening and what they see. Scenes or items are labeled which I have always loved about his books. So, for example, he will label things properly like the locomotive and caboose, but he will also draw a huge pickle and turn it into a car and label it a pickle car! I don’t know of any boy who doesn’t like reading this book. It really keeps their interest. You might as well just buy it now. This is one of those books that you are going to end up owning anyway. Note – it does say something about being scared of monsters but the book is not a scary monster book at all. Grover is the star/main character and is breaking the fourth wall (talking to you) throughout the book. He doesn’t want to see the monster at the end of the book, but your boys will laugh and laugh at the fun ending. With simple stories and nice illustrations the Bear stories are a hit. Bear Snores On is about Bear who is hibernating and his friends who are in his cave having a party. What will happen when Bear wakes up? This is a gentle rhyming book that has charm and a nice story. Makes a nice bedtime story book as it is short and relaxing to read. The Pigeon Needs a Bath, but, as you can see by the cover of the book, the pigeon disagrees! What started with Don’t Let The Pigeon Drive the Bus has gone on to include a whole lot of pigeon books! These are super popular with boys and are not to be missed. Yes, the pigeon is a bit sassy but your boys will be laughing at all the reasons he does not think he should have to take a bath. If your three-year-old resists baths this is perfect, but even if he is happy to splash in the tub he will still love it. If your boy is a Thomas fan, or loves trains, I think this is a great book for him. There are 60 flaps to lift which is a lot more than most books have. This is a large board book so it will hold up well to all of the use it is going to get. Thomas and Friends Lift-and-Look Book features many of the engines and characters of Sodor and your boy is sure to love how interactive this book is. I never felt this book got enough attention. I loved it. We read it a lot. Art is a young boy who loves to make art of all sorts. Great for everyone, including adults, but boys who like to paint, draw etc. will especially enjoy it. It celebrates creativity and following your passion. The rhyming, the wild art Art creates, and the ending, make this a must read in my opinion. If you were scrolling quickly, take another look at the cover of Flip Flap Farm! See the cow/pig and the sheep/goat? This interactive book is funny. Not only is it full of rhymes that will make them laugh but, the very best part is the flaps you can flip to make silly animals as seen on the cover. They are going to have a blast with this one! There are other books that share the same or very similar name so be sure that you get the one with the two tone cover by Alex Scheffler. This book is here for various reasons. First, and foremost, because the Biscuit books are gentle and lovely to read. The second reason I chose this book is because of the library focus. If there is any way you can spend time at your local library on a regular basis, it will benefit your boy greatly to do so. The third reason is I think that grabbing a few of the I Can Read style of book just before they are ready to read or just when they are beginning lets them explore books in a new way. In Biscuit Loves the Library, Biscuit the puppy explores the library since it is read to a pet day there. There are a lot of other Biscuit books to choose from. They are all good. This book has a lot of 5 star reviews and some 1 star reviews as well. The vast majority of the 1 star reviews are calling the book sexist because it is “for boys” though a few mention that the airplanes are jets and the bulldozer is a front end loader. I agree that the airplane is a jet, but is a jet not an airplane? As far as the bulldozer vs front end loader goes, I would point it out and go on the Internet to show the difference. Use it as a learning experience. Each letter has a hand-illustrated picture along with a capital letter and the object name written out. Funny and super well done. If your boy has this one already, just grab one of the later stories in this series of books. In How Do Dinosaurs Say Good Night you have examples of how not to say good night. While I wouldn’t personally use the book as a “lesson” if you are having trouble getting your boy to go to sleep at night, I would use it for a silly and fun read. From the book: “Does a dinosaur slam his tail and pout? Does he throw his teddy bear all about?” There is much more where that came from. And, be sure to take a peek around the illustrations to find the hidden dinosaur names. Many people miss them for some reason! This charmer is not to be missed. Be prepared to read it often. When Mrs. Mallard decides that the ponds at the Boston Public Gardens are the perfect place to raise her baby ducklings there is a little bit of a problem. How are they going to make their way through all of the traffic. Well, the police come to the rescue! Make Way for Ducklings is a classic keeper. It won the Caldecott Medal in 1941. Now is a wonderful time to start introducing chapter books. You can take it slow and begin to read a bit of a chapter at a time if he is not ready to sit still (or move about listening!) to a longer story. Winnie the Pooh is a great one to start with. There are a lot of different editions of the Winnie the Pooh book. This one is the original edition just as it was published in 1926. Yes, there are prettier books out there but this is the one I like. If you choose a different one, try to find one that is unabridged so you can get fully immersed in the story and enjoy it as it was meant to be. Don’t miss our list of the 100 Best Picture Books for Boys! Make sure to always have non-fiction books on hand for your boys. From the very beginning of their book journey, all the way through until they move out on their own. Pay attention to their passions, or what they are even somewhat interested in, and put have those books in your house. What a fantastic way to introduce the world of robots and technology to your three year old boy. I had a hard time deciding where to put this book, in fiction or non-fiction but I ended up putting it here because while it reads like a fiction book, the details of what the robots do are accurate. Each two-page spread features a short sentence or two about robots and what they do. For example: Up in space, beneath the seas, robots make discoveries. Personally, what drew me to this book in the first place were the illustrations. I actually thought the book had been published some time ago but it is a new Golden book that just happens to have charming mid-century modern looking illustrations. I picked this Roaring Rockets astronaut book because is has a lot going for it. It is fun and has cartoonish characters (animals) and yet there is great information in the book as well. It is a mix between a picture book and a non-fiction book to be honest. There are not a lot of words in the book so it is good for fidgety boys who want a quick story. It is also great for learning the language of blasting off in a rocket. The National Geographic Kids books are very appealing to boys. I used them in my boys’ book club and everyone really liked them no matter what the subject was. The boys in my group were older than three but now NGK has come out with the First Big Book series that are just right for younger boys. They include topics such as space, animals, ocean, world, things that go and much more. Today we are looking at First Big Book of Dinosaurs as that is a very popular topic for preschool boys. Along with an artistic rendering of what the dinosaur may have looked like, there are facts, interesting tidbits, pronunciation key on each page, and a question to ask your child. If your boy likes dinosaurs be sure to check out our dinosaur activities as well. My Big Book of Trains comes in hardcover, paperback or a board book. We have the board book. I like it because it is very sturdy and this one got used a whole lot. I think boys who enjoy trains will really like this one because there are a lot of different trains that they have not likely seen before included in the book. The book is filled with nice photographs of the trains with the type of train underneath the image. There is a bit of other text heading the sections and making general statements or asking a question. Overall it is a low text book and the focus is visual. There is also a My Big Truck book. We had quite a few of the Roger Priddy books and enjoyed them all. Finding an encyclopedia for boys this age isn’t easy, let me tell you that! However, I really like to have encyclopedias and dictionaries that are kid friendly on hand and keep adding to those as a child grows. After much searching, I finally found this one. It is just right and he will grow into it. When reading it, simply let him pick the pages he wants to view and read as much or as little as he likes. The main thing one wants to do with encyclopedias is help them see that there are books that can answer some of the questions they may have and that by looking at these books we may even become curious about other topics. My Encyclopedia of Very Important Things does just that. It supplies just the right amount of info so as to tell a bit about the topic but not overwhelm. It covers the planet, places, animals, people, and things of interest to kids. If you want to know the basics on a topic, turn to Gail Gibbons. I always do. You can pick your topic as she has covered many, many things but do introduce your boy to her books. She is a master at framing things (<< sorry about the little house building joke there – couldn’t resist!) in a way that preschoolers and kindergartens can understand. Even older kids get a lot out of her books because she just explains things so well. How a House is Built shows different types of houses, and details of how a house is first designed by an architect, who then gets a general contractor to be in charge of the building. It walks boys through generally what happens from beginning to end. This is another great set of books for discovery. I would suggest sticking with the level 1 books and then grabbing a level 2 book on a topic they like to see if they understand it or if it is a bit too advanced. I picked A Nest is Full of Eggs as many people have robins around their neighborhood. Even if you don’t, it is still an interesting book about how birds build a nest. We actually had a pair of robins build a nest on the small brick ledge below an octagon window in a house we used to live in. I had to call a local bird sanctuary to see what we should do! The window was at the bottom of the steps and we were scaring Mrs. Robin when we went downstairs. The naturalist told us to place a piece of black fabric over the window. It was a wonderful close-up experience as we could lift the fabric and look while she was off the nest. Anyway . . . these books share a close-up view of nest building in case you are not lucky enough to see it close up and personal. See all of the level 1 books here. Depending on where your boy is on learning about numbers, you can choose which concept you wish to explore with him. For this list, I picked Jack the Builder which focuses on the skill of counting on which is counting forward from a number other than one. Jack is building with blocks and makes different things such as a boat or a robot while math is introduced in the text and visually. I used these books while homeschooling and they get the points across in an easy, casual way. Notice the silver circle? That is the Caldecott Honor seal. You will see why it won the award when you take a look at this wonderful book. Actually anything by Steve Jenkins is great and I am seriously in love with his illustrations style (cut and torn paper collage) and the amount of work that he puts into his books to make them not just good, but outstanding. In What Do You Do With a Tail Like That? he talks about tails, of course, but also about noses, ears, eyes and mouths and how animals use them. This is a fun one! You begin with a black page that has a circle in it. Through the circle you see part of the item up close. What is it? Can you guess? Wonderful for sparking conversation and for taking time to really observe. The Look Book is by Tana Hoban who is an amazing photographer. She has a beautiful way of presenting information to children. So many boys just love animal books and this one features animals but also art and poetry! Lots of Spots is about animal camouflage and adornment. We used this book for an art project. You can find out more about the book and the project by clicking through that link. 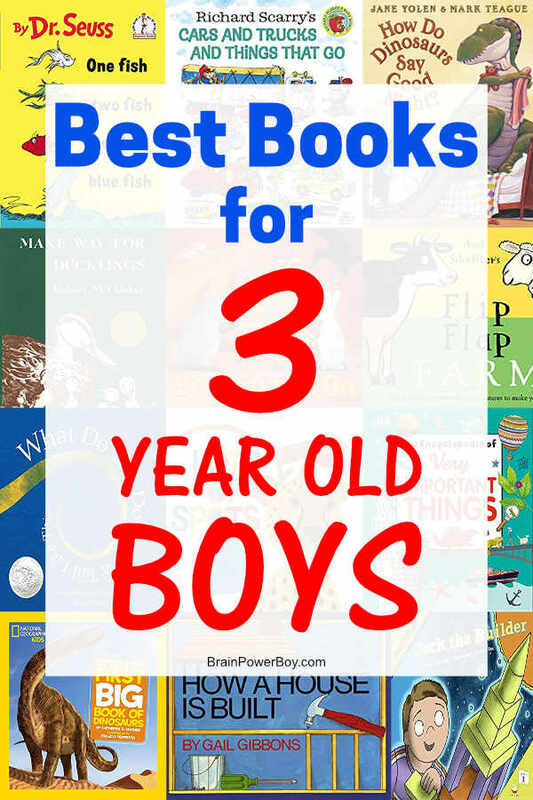 I hope you have enjoyed this list of the best books for 3 year old boys. I will be adding in new books if I see some that are must have titles. 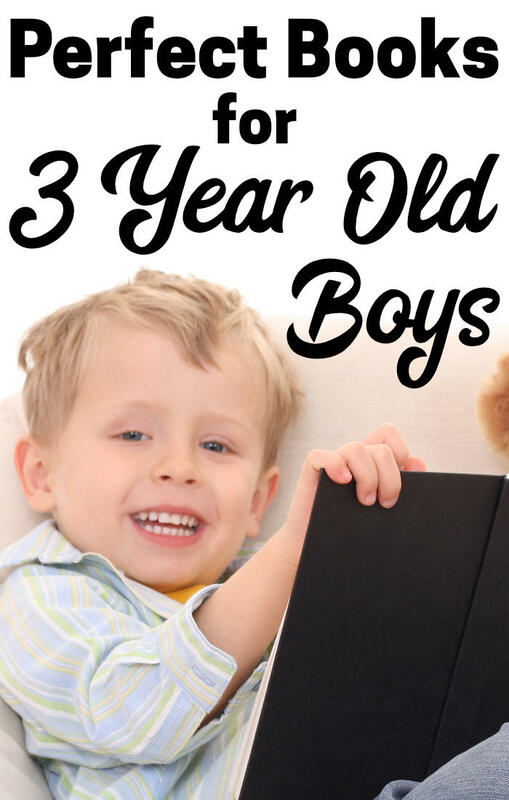 Feel free to leave a comment if you know of a great book for boys age 3. I would love to take a look. My parting advice to you and your young boy is to read, read and read some more. Then when you are done, get more books and read more. 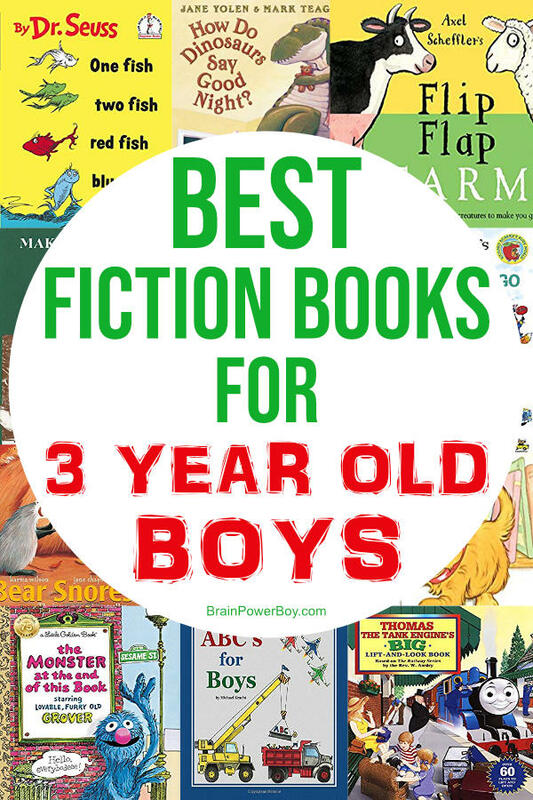 See also Best Books for 4 Year Old Boys as there may be titles in there that he would enjoy.